Our hearts go out to the families and pets affected by the wildfires in California. To aid in the relief efforts, Purina is donating $25,000 to GreaterGood.org to support the people and pets who have been impacted. These funds will help support immediate rescue efforts, purchase much-needed supplies, and fund rebuilding initiatives for individuals and communities affected by the fire. In times of natural disaster, Purina’s goal is to provide timely support to pets and people in need. We will continue to assess the situation and are prepared to send pet food and cat litter, as needed. 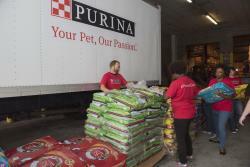 In 2017, Purina donated nearly $60,000 and more than 350,000 pounds of pet food and litter to support to victims of natural disasters across the United States.